Bovada opened in December 2011 and is operated by the same people as Bodog. Bovada hosts a number of poker games. Besides Texas Hold’Em, Bovada boasts Omaha and 7 Card Stud variants. Ring gsme action is primarily concentrated to low-stakes No Limit Hold’Em; however, there are always a few tables of Omaha and 7 Card Stud running. Sit and Go action at Bovada is suprisingly lively. The room offers a healthy variety of games, stakes, and tables with regards to SNGs. Multi-table tournaments are also popular. Bovada’s Sunday $100,000 Guaranteed is one of the best values on the internet. Cashouts at Bovada are relatively quick. Checks are the most popular method and are usually recieved in a week after your payout has been approved. 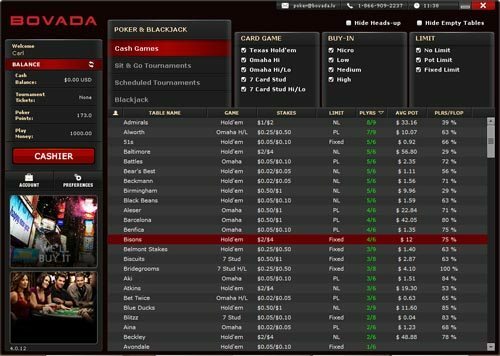 Overall, Bovada is a solid poker room Although Bovada doesn’t have the game selection of a giant like PokerStars, the brand is reputable and has adapted to changes in the legal and regulatory environment. The most convenient deposit option for players is to use a Visa card. However, these deposits are subject to a 4.9% fee, which is pretty large. So a $1,000 deposit would charge you an additional $49. Bovada now supports Mac! If you’re in the US and use a Mac, you may have found your choices limited. Well, not anymore – all Mac players can play for real money at Bovada in their new Mac client. Try it out now! Like Bodog Poker, the Bovada software has its highs and lows. Overall, its poker software is solid. When you log-in, you’re greeted with an edgy black-red theme. On the left-hand side of Bovada’s lobby, you can view your balance, tournament tickets, and poker points. You can also visit the cashier, make changes to your account, and adjust your preferences. At the top of the lobby, you can sort the lobby by Zone Poker, Cash games, Sit & Go Tournaments, Scheduled Tournaments, and Blackjack. You’ll also find conditional filters at the top of the lobby. To illustrate, if Cash Games are selected you are able to sort by Card Game, Buy-In, and Limit. Zone Poker is Bovada’s version of Rush/Zoom Poker, and is the first fast paced poker software for American Players since 2011. Basically, it works like this – You are dealt a hand, and if you don’t want to play it, just press fold. Instead of waiting for the hand to play out like normal, you’re immediately moved to a new table, and are dealt a new hand. You can play 2-3x as many hands in the same amount of time. For more details, see our full review of Zone Poker. The majority of the lobby is taken up by the list of tables. Like most poker rooms, Bovada’s main poker lobby is sortable by clicking the top of any column. For example, you can sort tournaments by start time and buy-in. Although this is standard, it is very useful. Once you’ve taken a seat, you’ll realize you’re a number, literally. At Bovada, there are no traditional screen names: everyone is an anonymous number. Love it or hate it, but that’s the way it is. Bavada’s poker interface while seated is similar to other rooms. You can chat in the bottom-left corner, view your hand history in the top-left corner, and betting is done in the bottom-center. The hand history at Bavada Poker is rather clunky. If you’re used to a slick hand history feature, like PokerStars, you’ll be disappointed. Bovada does provide one unique feature in their hand history system. 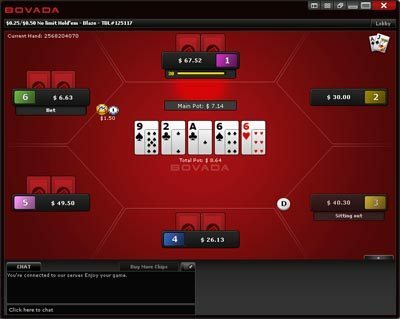 Unlike other card rooms (who offer only information on a player’s own hand), Bovada’s hand histories can be made to reveal the hole cards of all the other players at the table. This option can be found in the “Account” area of the software, from which users can request these histories. In order to keep this from compromising the integrity of their games, Bovada has imposed a 24 hour time gap. Players will need to wait a full day before being able to see hole card info on a particular hand. To sum it up, Bovada’s poker software is decent. It’s nothing special, but pleasant-looking and free from fatal errors, like random crashes and terrible lag, which make some poker room experiences unbearable. For the most part, the action on Bovada Poker is good. Games are running around the clock, but game selection tends to decline past midnight. As far as variety of games go, Bovada is top notch. The room offers a variety of cash games, sit and gos, and tournaments. Texas Hold’Em is the most popular game but Bovada also offers Omaha and 7 Card Stud. The games are about as tough as you can remember from Bodog Poker, since they same the same traffic. If you’re not familar with Bodog, Bodog tends to be fishier than normal. One huge problem with fish at Bovada is the anonymous tables – you never know if you’re playing the same big whale. This can become pretty annoying. The level of play in tournaments and SnGs is weak. If you follow a proper typical tournament doctrine, you should be able to make some money. Bovada provides players with a 100% up to $1,000 bonus on their first deposit. For example, if you deposited $400, your bonus account would be credited with $400. Later, if you made a $600 deposit, you will receive $600 more in bonuses. For every 5 poker points, $1 is earned. The bonus is released according to the schedule below. Players have 60 days to earn the bonus. After 60 days, the bonus expires and can no longer be earned. Bovada runs seasonal promotions across its poker room, sports book, and casino. Past poker promotions usually happen around major holidays, like Christmas. Typical holiday promotions include festive countdowns which give players a chance to win cash, freeroll entries, or tournament tickets. Check out the promotion section on Bovada’s website for the lastest poker promotions. Bovada Poker has a great support team ready to answer your questions. Bovada support is available 24/7/365. You can contact Bovada through live chat, a webform, or any of the methods below.